A consultant’s report released Thursday afternoon recommends that the Salisbury University Foundation negotiate a deal with another public broadcaster to operate both of its Delmarva Public Radio stations as music stations, dropping the NPR News format now airing on WSDL 90.7 FM in Ocean City, Md. 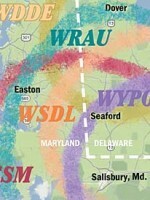 The foundation, licensee of WSDL and WSCL 89.5FM in Salisbury, Md., has been covering financial losses at the stations for three of the last four fiscal years — most notably covering a loss of more than $150,000 in 2008 — and faces increased capital expenses in relocating the stations’ studios from a university building that’s set to be demolished. The Delmarva stations closed fiscal 2010 in the black with about $25,000 in net income, but the overall financial picture and increased competition from other NPR stations in the market prompted the foundation to reconsider how the station is managed and financed. “It was a good opportunity for us to take a look at the stations and what’s happened over the last 25 years and what will happen in the future,” said Jason E. Curtin, interim assistant director of the Salisbury University Foundation. “We’re trying to find the best way to serve the area and be good stewards of the stations that we hold.” The foundation retained Public Radio Capital, the Colorado-based consultancy specializing in public radio signal expansion and preservation, to analyze the stations’ performance and recommend options for operating them in the future. According to Arbitron’s fall 2012 survey, Salisbury/Ocean City is the 140th largest market in the U.S. with a 12-plus listening population of 329,700. The market is home to Ocean City, one of Maryland’s most popular oceanside resorts, which in the summer months sees population explode into the hundreds of thousands. WSCL, Delmarva’s classical outlet, received its license in 1986, along with WESM 91.3 FM in Princess Anne, a jazz and NPR news station owned by University of Maryland Eastern Shore. Until 1997, when the Salisbury University Foundation added news station WSDL, the two universities were the only institutions providing public radio programming to the market. The landscape changed drastically in 2010 when WAMU in Washington, D.C., and WYPR in Baltimore extended their signals to the market on WRAU 88.3 FM and WYPO 106.9 FM, respectively. The signal extensions gave Delmarva listeners five options for NPR News and talk programming. According to PRC’s analysis, the best option for preserving Delmarva Public Radio’s service to the region is to drop NPR News programming from WSDL and convert it into a Triple A music station, introducing an unduplicated public radio format to the region. PRC also recommended the foundation enter into a public service operating agreement, or PSOA, with another public broadcaster, an arrangement that allows it to retain ownership of the signals but eventually end the stations’ reliance on university subsidies. According to PRC’s projections, if the foundation continues to operate the stations as it is now — a so-called “status quo” scenario — by 2022 its operating deficits could reach as high as $240,000 a year. PRC also recommended keeping WSCL as an all-classical format, but picking up Classical 24, the syndicated programming stream produced by American Public Media and distributed by Public Radio International. The report said that even with staff reduced to a “licensee staff person” and whatever the new operator wanted to bring aboard, the PSOA would not come at the expense of local programming. If the foundation opts to follow PRC’s recommendations, the next step would be hiring a third-party to facilitate the PSOA. Before making a decision the foundation is planning a meeting for Tuesday, Oct. 16 at 6:30 p.m. in the Wicomico Room of the Guerrieri University Center at Salisbury University to hear public comment on the report and recommendation. An analysis recommends that the Salisbury University Foundation negotiate with another pubcaster to operate its two Delmarva Public Radio outlets as music stations. Can’t say I know much about the Delmarva peninsula, nor how it relates to the rest of Delaware…but what about the brand-new WDDE? Why not some sort of partnership with them? Seems a shame to sacrifice a local news station in favor of out-of-market sources? I remember hearing about those stations going on air and wondering how that market would support so many public radio services. Did Public Radio Capital have a hand in either the WYPR or WAMU repeaters? It’s sad that one of the incumbent stations (that helped create the demand for public radio programming) is going to pay the price. Regardless of where it broadcasts from; NPR is essential to Delmarva. We must keep the news and info that links us with the nation & the world. The knowledge NPR provides is priceless!